In order to improve PCB manufacturing and assembly efficiency, we recommend panel design for PCB manufacturing and assembly, panel will also reduce assembly cost in a way. Min panel for assembly can be 50*50mm and max can be 330*530mm. Panel design can be provided by you or we do the panel design according to your request. 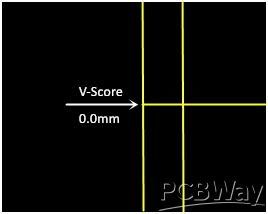 You can leave message about panel design to us when you submit new order on PCBWay. For V-scoring panelization, space between boards can be 0mm or 3mm. Please take following images as reference. V-scoring has to be continuous and can not be stopped in panel, if you have many different boards like following image to be panelized, we suggest add tab routes between boards instead of V-scoring. For panel with tab routes, 1.6mm space is needed between boards. There are 2 kinds of tab routes be used for panel. One is tab route with breaking holes(stamp holes) and the other one is tab route with tab. (no holes). For tab route with breaking holes diameter should be ≥0.45mm, regular diameter is 0.55mm-0.6mm. 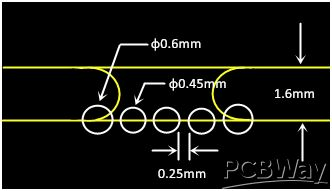 Holes space has to be ≥0.25mm, usually we will add 5-6 holes to each tab, please take following image as reference. Tab route with tab, tab width has to be at least 2mm, please find following image. 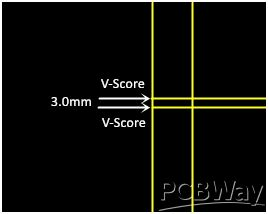 For panel with both V-scoring and tab routes, V-scoring area space should be 3mm and tab routes area space should be 1.6mm, please take following image as reference. Fiducial marks are needed during assembly, usually there are 3 fiducial marks in each panel. Marks diameter is 1.0mm and placed in the middle of edge rails. Please find following image to get more information. Besides fiducial marks, mounting holes are also needed for panel design. Usually there are 4 mounting holes per panel, holes diameter and location is shown in following image. For more information to assembly, please leave messages to us or contact your exclusive service representative through email.